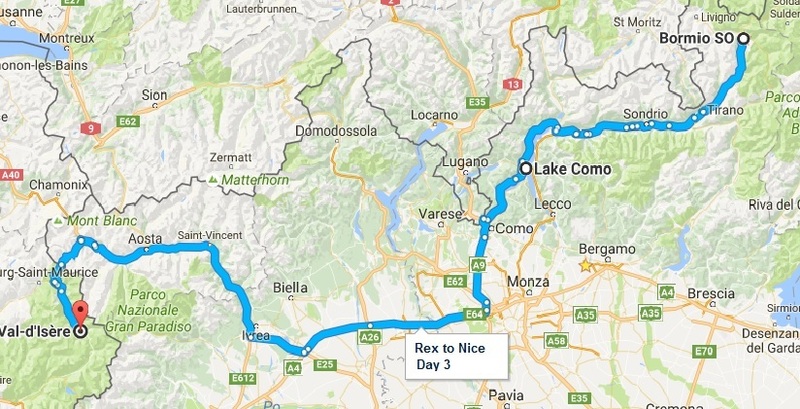 Day Three of the banger rally challenge – Rex to Nice, main route option can be seen below. The charity car rally starts from Bormio and finishes at Val-d`lsere. We have three route options today. Main route along Lake Como and up the Aosta valley. The “goldeneye option” an option to visit the dam from Goldeneye (James Bond). But for the hardened banger rallier the massive “Full Italian”. This massive day takes you over the two pass from the Sir Micheal Cain film “The Italian Job” (Swiss vignette required). We advise small use of a toll road today to get around Milan about 10 euro. Rex to Nice Over View.